As we know roulette was played in the 17th century in France. Monte Carlo and Monaco casinos are the leaders in offering halls for playing roulette nowadays. However, every gambler should first learn the rules and then enter the game. As a rule up to 8 players play against the house represented by the dealer, who actually spins the roulette wheel and handles all the payments and bets. In European roulette the wheel has 37 numbered slots representing 36 numbers and single zero (0), and American game disposes two zero slots (00) and, thus, 38 pockets. Each player has to buy colored chips in order for the bets not to mix up. At the end of the game, each player may certainly exchange the winning chips into cash chips. Such chips have the value denoted on them. The player takes them to the cash desk and changes for real money. The bets are usually made at the playing table by placing them into the layout of the table on the numbers relevant to their equivalents on the wheel. Until the ball is spinning, the players are not allowed to make bets, remove anything from the table, etc. Only after placing the dolly (special figurine) on the winning number marked on the table and removing all losing bets, the player can start over making bets in the time of remuneration of the winners by the croupier. This very rule is applicable to the even-money wagers only by not all casinos. For instance, if the result is zero, some casinos allow the players to either take back half of his bet, or remain the wager for the other roulette spin. If the other spin point zero, the bet is lost. This rule is common to the previous one. However, in this situation the player loses half of the wager and cannot use the option of remaining the bet for the other spin. Both rules usually can cut the edge of the casino on the even-money wagers in half. It is also applicable to the zero outcome. The only way to predict the game outcome is to watch and predict the ball landing after each of the spins. It is not so easy. The luck plays crucial role in the game. Many players are guided by the numbers winning called "hot" as they are repeatedly occurred. Some players make bets on several numbers to increase the chance of winning at each spin. Anyway, the payment is reduced in such cases. 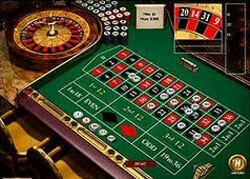 Experienced players use special roulette systems or methodic, as well as money management. On a single zero roulette table the percentage of the house win over is 2,7. However, the double zero pocket increases the advantage of the house up to 5,26 per cent. It decreases the chances to get casino bonus.